Why Become a Sponsor with OREIG? People prefer to do business with those that they know and trust. We want to help you to build that relationship with our members and our network. Where else would you be able to connect with such a targeted audience in one place? We use various methods to communicate with our Greater Network including a strong Social Media and Direct email strategy. Our Network is currently over 7000+ and is expected to grow exponentially as we develop new Cross-Marketing partnerships. 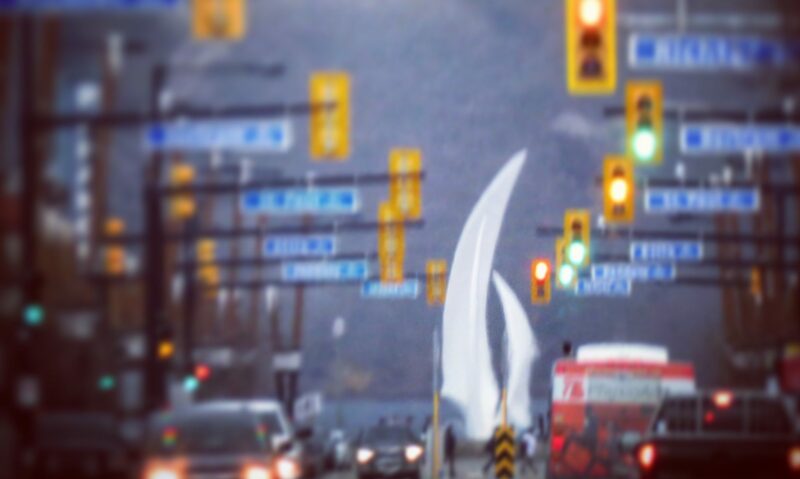 Our network is primarily located in the Okanagan and is geographically and demographically targeted to Real Estate Investment. As a sponsor, we strongly believe you are immediately seen as the expert in your field by our members. Our sponsorship opportunities are designed to give you, our valued partners, as much exposure as possible to help you build your database and acquire new clients. The Gold Package is designed for those companies that want the most impact for their advertising dollar. Our audience matches their target demographic and they will see huge benefit by being able to interact with them in numerous ways. Gold Sponsorship is the only package that allows you speak directly to our Live audience on stage. This creates a definite exclusivity and sets you up as the “expert” in the minds of the audience. Gold Sponsors are mentioned with a high frequency at events and online. Gold Sponsorship allows your banners and signage at the front of the room beside the screen at events. The Gold Sponsorship requires a minimum 3 month commitment at a monthly cost of $300 plus GST. 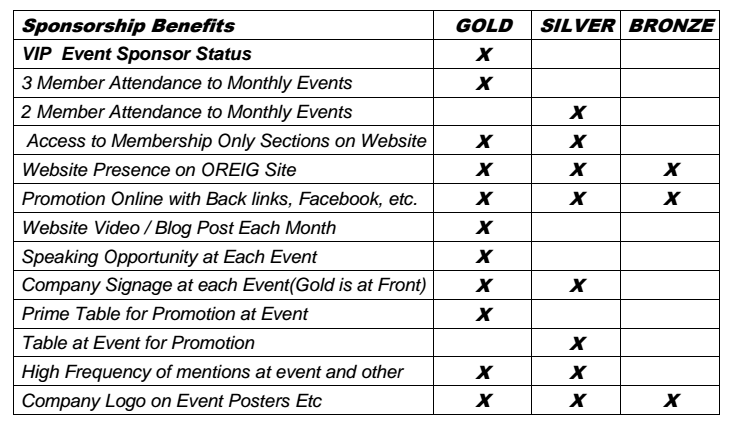 The Silver Sponsorship Package offers great value for advertising and great interaction at events with OREIG members. Members see Sponsors as experts and committed supporters of the group. This builds both rapport and reciprocity with potential clients. Online advertising on the OREIG website, Facebook page, and direct email to our list and associate lists. The Bronze Sponsorship Package offers great value for those companies wishing to gain exposure to our targeted audience. This package provides both online and event advertising to get your name recognized amongst members. This package is for those who are not interested in attending yet they know the value of event sponsorship.